Tankless water heaters may require additional attention during cold weather to prevent them from freezing or experiencing other weather related problems. Recommendations may vary between manufacturers, so it's important to check your owners manual for details on your specific unit. During cold weather tankless water heaters need extra care. Even water heaters installed indoors could be prone to cold weather complications. Most manufacturer warranties do not cover damage caused by freezing. Many manufacturers, such as Rinnai and Rheem, build-in some type of freeze protection that allows the unit to protect itself when temperatures fall below freezing. Rinnai​ has two lines of defense from the cold elements. The primary protection for the Rinnai, is the placement of ceramic heaters located on the heat exchanger and other internal parts and water lines. These ceramic heaters will fire-up when the temperature drops into the low 30's and prevent the internal parts from freezing. If the ceramic heaters fail for any reason or the temperature drops too fast, a secondary freeze protection method is also built-in. When the sensor inside the unit senses that the tankless is below freezing, it will automatically turn the unit on for a few seconds until the water inside reaches approximately 58 degrees. The unit will continue to cycle on and off until the threat of freezing has past. Both of these methods provide freeze protection to the Rinnai unit as long as electrical power and gas is available and reaching the unit. ​Be sure to check your owners manual for details on your specific tankless. Allow the tankless unit to thaw. This can be checked by OPENING the Water Supply Valve. If water flows, the tankless has thawed. Carefully INSPECT the external pipes and the internal components and plumbing for leaks. If everything looks good, you can OPEN the Gas and Water Valves and turn the Electrical Power ON. Wrapping the external pipes and valves to prevent them from freezing is a simple and inexpensive preventative maintenance task that can prevent major headaches. 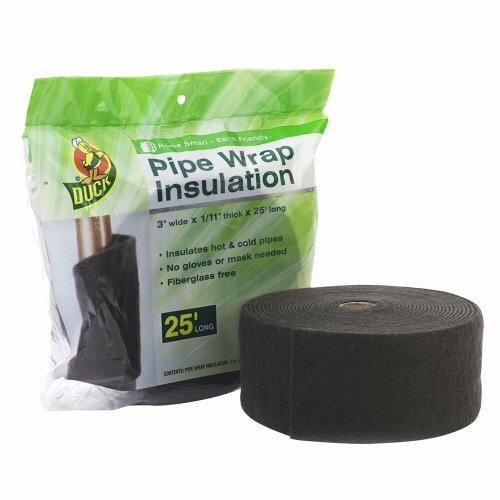 This wrap can be used on both hot and cold pipes by itself or with a pipe heating cable. It is available on Amazon. 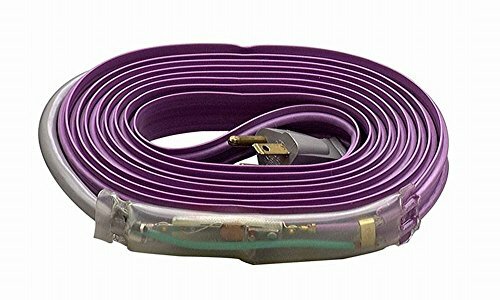 This pipe heating cable has a build-in thermostat. It can be wrapped around your external pipes to help prevent the pipes from freezing in temperatures up to -50 degrees. It is also available on Amazon. Even with built-in freeze protection, there are times when you need to drain your tank. If you should lose power your tankless will be left defenseless to the cold temperatures and may freeze. We highly recommend, particularly for cold climates, to drain your unit if you will be away for an extended time. ​Although, tankless units ​can always be drained manually, installing freeze protection solenoid valves is an excellent way to give you peace of mind during cold weather. These valves will automatically drain the water from your tankless in the event of a power outage. Installing a freeze protection solenoid valve kit on your outdoor unit is an excellent way to safeguard against freezing. This valve kit is made made by Rinnai for their outdoor water heaters. It's available on Amazon. The freeze protection solenoid valves, also known as drain down solenoid valves, are designed to always be open. They are sometimes called "normally open" drain down solenoid valves because they require an electrical current to keep the valve closed. 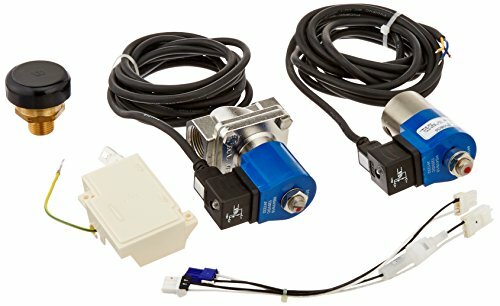 Should the power fail, the valves will automatically open and release the water inside the unit. Although optional, installing these valves is an excellent way to protect your unit, especially in cold regions. Best Practice: Even with freeze protection﻿ solenoid valves installed the pump drain plug, condensate trap drain plug and water drain plug should be manually opened to allow any water trapped inside to drain. Whether you are draining your unit for cold weather conditions or another reason, if your tankless unit doesn't have the freeze protection solenoid valve kit installed, you will need to manually drain your system. Manually draining is not as easy, but it's just as effective at removing the water from inside the unit. Here's how to manually drain your tankless water heater. Turn OFF the Cold Water Supply and turn OFF the Gas Supply. Place a bucket under the water heater to catch the water. Remove the Drain Caps on the Hot and Cold Isolation Valves. OPEN the valves. The hot water is under pressure, so it will likely shoot out of the unit. Use caution, it may be hot. REMOVE the Cold Water Inlet Filter. We recommend opening a Hot Water Tap inside the house BEFORE opening the valves. This will help relieve the pressure in the unit. If your unit has drain plugs, you should remove them. They are located on the bottom of the tankless. Water Drain Plug; Pump Drain Plug; Condensate Trap Drain Plug; and the Hot Water Drain Plug. Double check that all the drain plugs are removed from the unit, the hot water taps within the house are closed, and the gas supply is OFF. ​Replace the Water Drain Plug, Pump Drain Plug, and Condensate Trap Drain Plug. OPEN the Cold Water Supply to allow the unit to fill with water. OPEN a Hot Water Tap within the house to check that the water is flowing thru the unit properly. Then CLOSE the tap. Turn ON the Electrical Power to the unit. Double check that the Temperature Controller is OFF. In some cases where the temperature is beyond the unit's ability to freeze protect itself it may be necessary to run a low volume of water thru the tankless to keep it from freezing. This method could also be helpful if there is a loss of power. Following these steps may prevent the unit and the external piping from freezing. We do not recommend using this method for extended periods of time, such as vacations, etc. Turn OFF the Electrical Power to the water heater. ​CLOSE the Gas Supply Valve. OPEN a Hot Water Tap within your house. The water should flow at a rate of 1/10th of a gallon per minute or the water stream should be .2 inches in width. ​​If you have a tankless water heater at a vacation home or plan to be away during the winter, you may want to consider winterizing the unit as a precautionary measure to protect it from freezing. Cold weather conditions can happen quickly and planning ahead can save you a major unexpected headache. Check: These instructions are provided as a guide and your individual unit may have different requirements. You should always consult your owner's manual for directions on your specific unit. Consider: Hire a licensed professional to do the work for you, ask if they will guarantee their work and cover any expenses if the job was not done correctly. If you take good notes, you'll know exactly what to do next year! Drain the unit by opening the freeze protection (drain down) solenoid valves on the cold and hot water lines. Open a couple hot water faucets in the house. Remove the inlet filter on the cold water line. If your unit has a plug or inline filter on the hot water side it should also be removed to leave room for expansion if there is any water in the lines that freeze. Turn OFF the power supply to the unit by either unplugging or flipping the circuit breaker off. This will protect the tankless should there be any power surges or outages. If it can be safely reached, place a cover on the end of the vent, both the intake and exhaust. This will keep debris, leaves, and even small animals such as squirrels from becoming trapped within the vent and causing air flow issues when it's time to start using your tankless again.